Hearty Congratulations to our newest nationally certified member, Miriam Brown. Miriam earned her Bachelor of Music Education degree (piano) from Wittenberg University and her Masters in School Counseling from the University of Dayton. She studied piano through high school with Mary Sue Schlegel of Sugarcreek, Robert Wynne at Wittenberg and later added harp studies with Jean Harriman, additional studies with Alice Chalifoux and also Jeanne Norton. She taught elementary music in Gahanna where she incorporated music techniques of Kodaly, Orff and Dalcroze. WOSU AirFare Magazine featured Miriam, with a description and photos of her exemplary teaching project in which her mission was to foster music appreciation and creativity in her students and families. Miriam maintains a piano studio at her home and enjoys teaching students of all ages including adults. She is a member of the American Harp Society, MTNA, National Guild of Piano Teachers and Central East OMTA where she is Vice President of Student Activities and the Out and About Chairman. As Out & About Chairman, Miriam sets up volunteer playing opportunities for students at local hospitals, senior living places, Malls, recital events, and more! As a professional harpist, Miriam regularly performs for weddings, fundraisers, corporate events, and private parties in the greater Columbus area. Her long-term engagements have included Franklin Park Conservatory Candlelight Tours, Sunday Brunches at the Hyatt Regency (five years), and FiftyFive at Crosswoods (eight years). 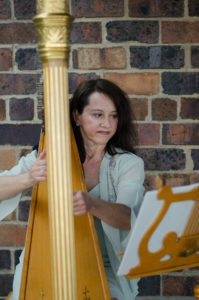 She also performs in a flute-harp duo with Valorie Adams-Hildreth. Miriam recently submitted the five projects to the MTNA Board of Certification Examiners. After evaluation, she was named an NCTM, Nationally Certified Teacher of Music, in Piano. She will be honored and awarded a certification pin at the OMTA Spring Conference on April 13, 2018. This entry was posted in Blog, Certification, General Information, Teacher Events by Cynthia Adams. Bookmark the permalink.